Pilosa is an order of placental, New World mammals that includes the anteaters (suborder Vermilingua) and the sloths (suborder Folivora). Like the armadillos (order Cingulata), also of superorder Xenarthra, pilosans are distinguished from other mammals by the presence of xenarthrales (additional, unique articulations between lumbar vertebrae), a double posterior vena cava vein, a divided womb in females, who also have a common genital and urinary tract. They differ from armadillos in that extant pilosans lack armor and have a lot of hair. They are found today mainly in Central and South America, although their range extends into Mexico and southern United States. Anteaters and sloths provide unique examples of ecological harmony. Anteaters, for example, consume ants and termites and yet feed only a short time and lightly at any one nest, allowing the insects to replenish their colonies. The fur of a sloth serves as the home to many insects and sloths also have a mutually beneficial symbiotic relationship with algae, providing a habitat for algae while the green color added to the fur helps to camouflage the sloths. The sloths also provide fertilizer for the trees in which they live and forage. How these large and yet often ponderously slow animals, particularly in the case of sloths, survive in the face of large predators in their ecosystem also adds to the wonder of nature. Sloths, for example, can be so well camouflaged in the trees that they they resemble a part of the tree or even, when rolled into a ball to rest, a termite nest. 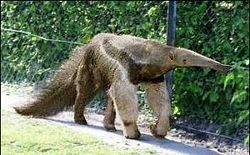 While anteaters can gallop away from predators, they also have front claws that are formidable weapons, capable even of killing a jaguar. Both anteaters and sloths have a slow metabolism that allows them to fulfill a unique niche that is not well exploited by other animals. Pilosa, comprising the anteaters and sloths, is one of two orders currently placed in the superorder Xenarthra, the other being Order Cingulata (armadillos). In the past, Pilosa was regarded as a suborder of the order Xenarthra, while more recent classifications largely regard Pilosa as an order within the superorder Xenarthra. Earlier still, both armadillos and pilosans were classified together with pangolins and the aardvark as the order Edentata. It was subsequently realized that Edentata was polyphyletic—that is, it contained unrelated families—and was thus invalid. Members of the Superorder Xenarthra are characterized by additional articulations between the lumbar vertebrae known as senarthrous vertebrae or xenarthrales, which distinguish them from other mammals. The name Xenarthra, meaning "strange joints," references this unique characteristic. These lumbar additions are held to support the armadillos in digging and the sloths in handing. Extant xenarthrans also have a double posterior vena cava vein that differs from the single vein in other mammals, and the presence of a divided womb that is reflective of the double womb of marsupials albeit primitive (Smithsonian 2011). Extant xenarthrans tend to have lower metabolic rates than expected for their size, and body temperatures also tend to be lower than similar mammals, resulting in the burning of fewer calories. These characteristics suggest an adaptation for the low energy content of their foods and why these generally sluggish animals have been able to survive in their narrow ecological niche, since competition might be limited with other animals not able to fully exploit these habitats (Smithsonian 2011). The name Pilosa comes from the Latin word for "hairy" (Kidd 1973). This term reflects that extant pilosans can be distinguished from extant armadillos in having a significant amount of hair. They also differ in the absence of armor found in armadillos (Smithsonian 2011). Pilosa is divided into two suborders: Vermilingua ("worm-tongue") comprising the anteaters, and Folivora comprising the sloths. The biogeographic origins of the Pilosa is still unclear, but they can be traced back in South America as far as the early Paleogene (about 60 million years ago, or only a short time after the end of the dinosaur era). Early xenarthrans appeared to share the continent only with primitive mammals, including early marsupials, and the absence of competition resulted in their flourishing (Smithsonian 2011). 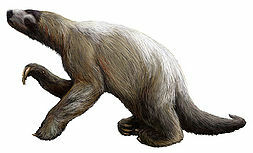 About 38 million years ago, there were three families of ground sloths, including some that grew to the size of modern elephants (Smithsonian 2011). The presence of these animals in Central America and their former presence in North America appears to be the a result of the Great American Interchange, whereby they rafted across the sea barriers (Smithsonian 2011). A number of sloths were also formerly present on the Antilles, which they reached from South America by some combination of rafting or floating with the prevailing currents. Kidd, D. A. 1973. Collins Latin Gem Dictionary. London: Collins. ISBN 0004586417. Narita, Y., and S. Kuratani. 2005. Evolution of the vertebral formulae in mammals: A perspective on developmental constraints. Journal of Experimental Zoology 304(2): 91-106. Smithsonian National Zoological Park. 2011. [http://nationalzoo.si.edu/support/volunteer/documents/SMH_Superorder_Xenarthra2011.pdf Superorder Xenarthra (Order Cingulata and Order Pilosa). Smithsonian. Retrieved June 5, 2014. This page was last modified on 8 June 2014, at 23:44.